Pug is an orphan on the Midkemia world. He is apprenticed to the wizard Kulgan, learns a bit of magic, saves a princess, and is granted a lordship. Then a war breaks out between the people of his homeworld of Midkemia and the Tsurani of Kelewan, who travel to his world through a "rift" in space. "Magician: Apprentice" Tells the story of Pug, of his friend Tomas, who receives a magic gift from a dying dragon, and of the war between the invading Tsurani and the people of Midkemia. 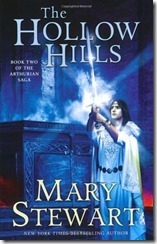 The stories are straightforward tales of high fantasy, in the tradition of Lord of the Rings, but simpler. Major themes are Pug's coming of age and the contrasting cultures of the two warring societies. I enjoyed reading it, but found the book unsatisfying by itself. This book and "Magician: Master" were originally published as a single volume titled simply "Magician". 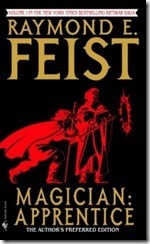 Following the success of "Magician", Feist expanded the story and released it as two separate novels. But it the two together form a single story and Book 1 does not hold up well on its own. To appreciate the story, you must read both volumes. Still, it is a good start to a good story and it is well told. 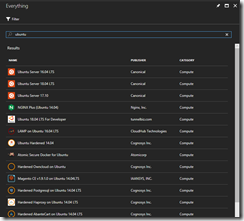 Creating a virtual machine (VM) may be the simplest thing to do in Azure. Azure VMs are very similar to on-premises VMs; in fact, they are built using the same technology - Microsoft Hyper-V.
You can create an Azure VM with just about any operating system, software, and data that you want. Hundreds of templates are available, pre-installed with a variety of configurations. 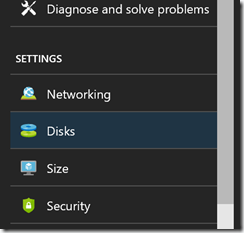 The first step in creating an Azure VM is the same step when we create any Azure resource - Navigate to the Azure Portal, log in, and click the [Create a resource] button (Fig. 1) at the top left of the portal. From the list of resource categories, select the "Compute" category; then select the template on which you want to base your VM, as shown in Fig. 2. If you don't see the VM you want, you can search for it by typing a partial description in the search box. This will display matching templates from which you can select, as shown in Fig. 3. After selecting a template, a blade with a brief description displays. Fig. 4 shows the blade for an Ubuntu server. Click the [Create] button at the bottom of this blade. The "Create virtual machine" dialog displays with the first tab - "Configure basic settings" - active, as shown in Fig. 5. Complete the forms on this tab. At the name field, enter a unique name for your VM. Choose one that will make it easy for you to identify it when you return to the portal to manage this VM. At the "VM disk type" dropdown, select "SSD" for a Solid State Drive or "HDD" for a standard hard drive. At the "User name" field, enter a name for the local administrator account on this VM. At "Authentication type", select either "SSH public key" or "Password" to specify how you want to log into this VM. I have selected "Password", which causes the "Password" fields to appear, requiring me to enter a password twice. Passwords must meet complexity requirements, including a length of at least of at least 12 characters and inclusion of numbers, alpha characters, and special characters. 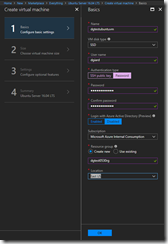 If you have an Azure AD configured, you can configure your VM to use this for authentication by selecting "Enabled" under "Login with Azure Directory". 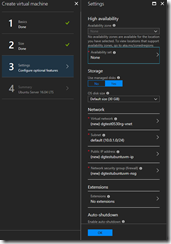 You will likely have only one Azure subscription; but if you have more than one, you can select the subscription with which to associate this VM. At the "Resource group" fields, select an existing resource group or create a new one. Resource groups are a logical grouping of resources that you want to manage together. If there are existing Azure resources that will interact with this VM, you may want to place them all in the same Resource Group. At the "Location" dropdown, select the region in which you want to create this VM. Location considerations include proximity to the people managing this VM; proximity to people using this VM; and proximity to any other resources that will interact with this VM. When the tab is complete, click the [OK] button at the bottom. The second tab - "Size" - will display, as shown in Fig. 6. On the "Size" tab, select the size machine you want to create. This is a long list, but you can filter or search to make it more manageable. Note that not every size is available in every region. After highlighting the desired size, click the [Select] button at the bottom of the tab. The "Settings" tab will display as shown in Fig. 7. 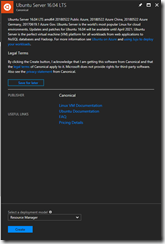 Azure provides default values for every setting on this tab, so it is not necessary to change anything. However, you can configure your VM to connect to a specific virtual network or subnet or assign a specific IP address or change any of the settings you like. When you are satisfied with the settings, click the [OK] button at the bottom of the tab. The "Summary" tab displays what you have configured, in case you want to change anything at the last minute. It also validates that all your selections are complete and consistent. If the validation lists any problems, you should go back and correct these. After validation passes and you are satisfied with your selection, click the [Create] button at the bottom of the blade. 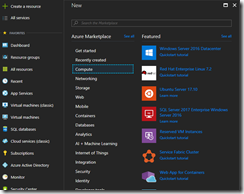 After a few minutes, Azure will create and deploy the VM based on your configuration. Once it is created, it is your VM and you can connect to it as you would any local VM. Use Remote Desktop to connect to a Windows VM or use SSH to connect to a Linux VM. Two weeks ago, I attended my first Imagine Cup event - the US Finals in San Francisco. Yesterday, I attended my second. The Canadian Imagine Cup Finals took place in Vancouver, BC. Six finalists competed for the right to advance to the International Finals in Redmond in July. This event was smaller and shorter than the corresponding US event; but equal in energy. Every one of the teams showed great creativity, strong technical skills, and impressive presentations. I was excited that all 6 finalists came from schools with which I work. 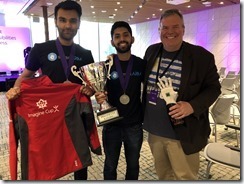 First place went to SmartArm - a project that provides affordable prosthetic arms for amputees - a team I helped mentor at the UTHacks hackathon in January in Toronto. I'm getting used to these Imagine Cup projects and competitions and I'm looking forward to the world finals. One of the challenges of working with data is what to do with missing data. A special indicator, such as "NA" or "NONE"
A value that makes no sense in the context of the data. The last one requires some domain knowledge about the data, so it is often difficult to spot. Replace the column with a reasonable value. If only a few rows contain missing data, it may be efficient to simply delete these rows. But if many rows contain missing data, it probably makes sense to keep them as other columns may contain valuable information. In this case, we will want to replace the missing data with a reasonable value. But what is a reasonable value? Options include replacing the column with an average value, such as the mean or median of the non-missing values. Of course, this is only valid for numeric data that is ordinal, that is data in which higher numbers indicate a higher value and not simply a discrete category. The Pandas library contains some simple functions for deleting rows and replacing values. The fillna function is the simplest way to do this. But for values that are not missing, but are inappropriate (e.g., using 0 to represent a missing data point, when 0 could be a valid measurement), we can use the map function. Below, we use the map function to want to replace any value in the 'area' column that has a value of 0 with the mean value for this column. In this article, we discussed ways to use Pandas handle missing data in a dataframe.